Some days there’s just production work to be done. As a working craftsperson – not every day is spend designing and making barnd new things! The times when I have that luxury are actually few and far between. 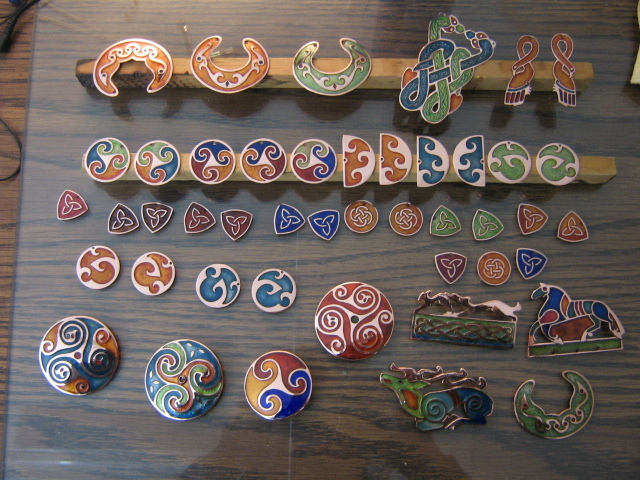 Most days at my enamelling bench I am trying to produce enough stock to sell at a show, and produce it in such a manner that I can charge as little as possible for it. 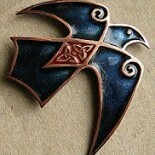 That’s hard with enamel, as it is by it’s very nature a slow and meticulous process. 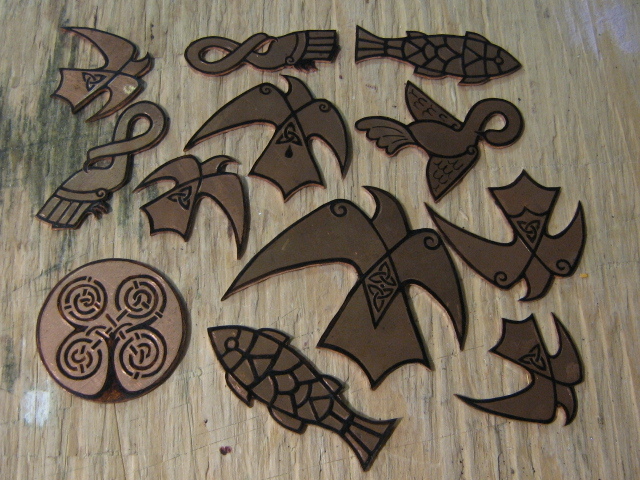 But there are small production runs that I do; rarely more than 10 pieces at a time – and that takes a week! I started doing production runs of my champleve years ago – it just made sense. All of the pieces have five separate stages that they need to go through – and it would be silly not to do them together – exspecailly the etching. It is hardly worth setting up an etch vat unless I am going to do more than one piece! It also makes sense to get into a groove of doing a certain job: polishing for example. I usually save up at least two batches (20 pieces or more) before I do a polishing. After the first couple of pieces I am getting the feel, and all the other pieces flow much easier. And faster! 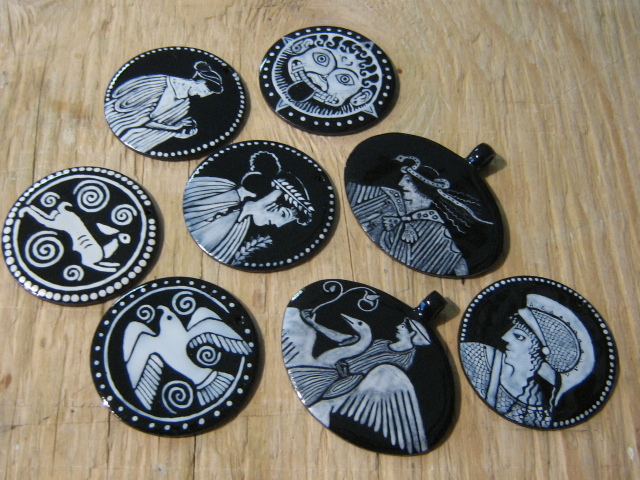 With the painted pieces I prepare up to 20 pieces with the black undercoat (2 firings on each side of the shape) but then I only paint as many pieces as I can finish in a day: three with grisaille and five or six of the Greek series. I don’t mind doing the production work. Many people think of it as boring – but for me there is as much satisfaction in producing the simple pieces as the complex ones. I get in my Zen mode and just let the work carry me along! Thanks! That's part of my series based on Greek mythology. This entry was posted on February 2, 2011 by imagocorvi in champleve, process and tagged art, champleve, creativity, enamel, enameling, production, work.